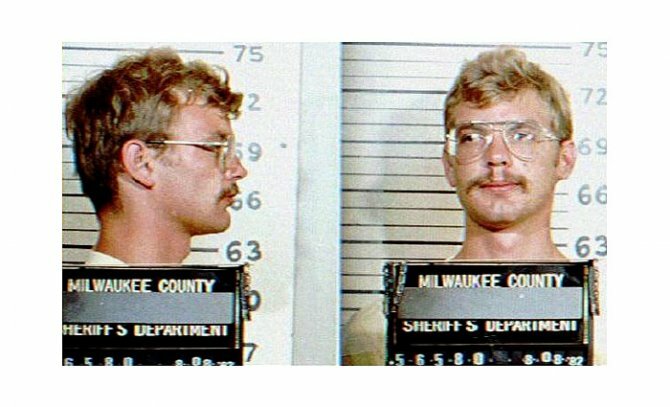 The above mug shot of serial killer Jeffrey Dahmer was taken in August 1982 after he was arrested by Milwaukee cops for exposing himself at a Wisconsin state fair. Dahmer was arrested again in July 1991 and charged with the murder of 17 men and boys over the course of 13 years. In 1992 he was found guilty of 15 counts of murder and sentenced to 15 life terms. In November 1994 the 34-year-old Dahmer was beaten to death by another inmate. Submitted by lisasmurf82 on Tue, 2011-03-29 15:46. Submitted by franktherabbit on Mon, 2010-11-29 14:00. Submitted by lisasmurf on Sat, 2010-10-09 19:24.
now this guy was one sick Fark!!!!!!!!!! Submitted by lmowery on Fri, 2010-10-01 12:13. I don't believe everyone on earth has plan and is here to serve a purpose, this guy was just an accident that should have never been born. Submitted by ThAp0oNg0oN on Sun, 2010-09-19 00:26.